Mekong River Delta provinces and cities, including the province of Bac Lieu, should focus on reviewing their planning of shrimp production with a view to the sustainable development of their agriculture. 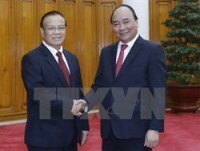 A statement to this effect was made by Deputy Prime Minister Trinh Dinh Dung while working with the leaders of Bac Lieu on the planning, production, export and consumption of aquatic products, as well as credit and policies supporting aquaculture. The Deputy PM inspected a shrimp farming model at the 30/4 Aquaculture Cooperative Group in Thong Nhat Hamlet, Vinh Hau Commune, Hoa Binh District, as well as shrimp farming households in the industry model in Hamlet 15, Vinh Hau A Commune. On the occasion of its visit, the working delegation also visited super-intensive shrimp farming models in greenhouses at the branch of Viet Uc Company in Vinh Thinh Commune, Hoa Binh District. 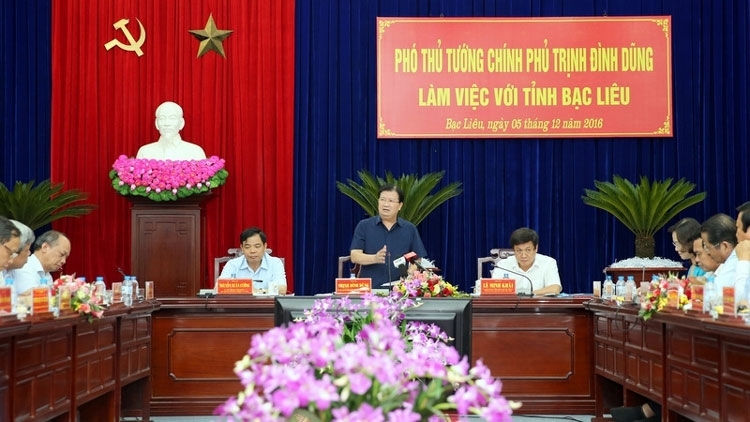 Speaking at the working session, Deputy PM Dung expressed his appreciation for the efforts made by the Mekong River Delta provinces to overcome difficulties, particularly drought and saline intrusion, to implement plans for socioeconomic development in 2016. He asked the local governments, including that of Bac Lieu, to accelerate the economic restructuring, focusing on agriculture in association with building new-style rural areas. It was very essential to prioritise the development of key products, particularly shrimp, of the Mekong River Delta region, in association with interregional development, contributing to creating highly competitive products, Deputy PM Dung noted. 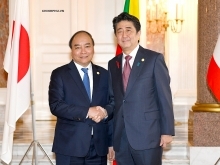 He also urged the Ministry of Agriculture and Rural Development to develop the overall project on the sustainable development of brackish-water shrimp by 2025, with a vision to 2030, and tp submit it to the PM. The Deputy PM asked the Ministry to review and propose measures and policies to promote the development of the shrimp industry as well as direct locales to develop the chain links in production.